Bonjour celebrates Youth Day & Singapore’s 53rd birthday! 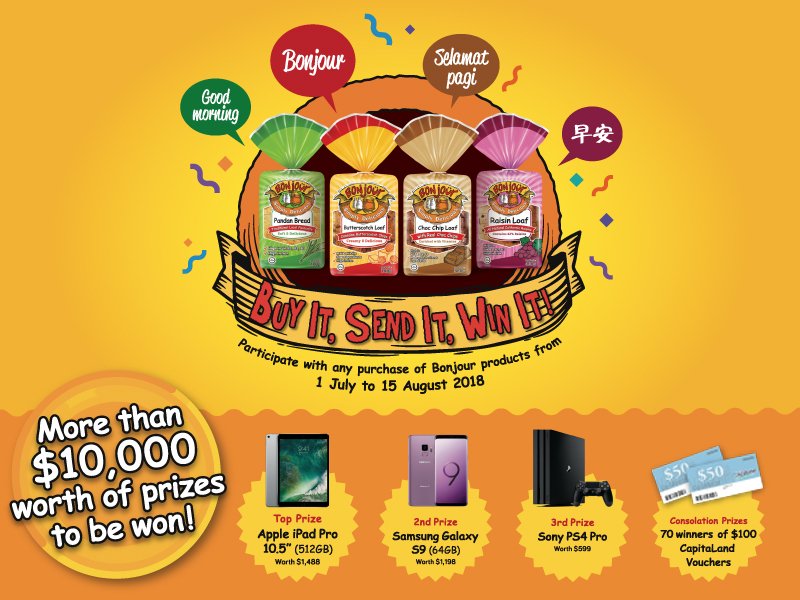 To reward our consumers, Bonjour will be running a lucky draw promotion in July & August. (B) Mail in any 1 Bonjour product packaging with the official entry form or written particulars (Full name as per NRIC, NRIC number & Contact Number) on a piece of paper to Bonjour Bakery Pte Ltd, Pasir Panjang­ Post Office, P.O. Box 002, Singapore 911184 by 22 Aug 2018. Lucky Draw is open to all residents of Singapore except employees & immediate family members of Bonjour Bakery Pte Ltd and its appointed agencies. For mail entries, multiple entries are allowed but one envelope will be treated as one entry only. Incomplete or inaccurate entries will not be accepted. All entries must reach Bonjour Bakery Pte Ltd, Pasir Panjang Post Office, P.O. Box 002, Singapore 911184 by 22 Aug 2018. For SMS entries, multiple SMSes are allowed but each SMS must be accompanied by a unique receipt number to be counted as multiple entries. Receipt must be dated between 1 Jul to 15 Aug 2018 for entries to be eligible for the draw. All valid entries must be received by 15 Aug 2018, 2359hrs. SMS entries without proof of purchase will be disqualified. Normal SMS charges apply. The Lucky Draw will be held on 27 August 2018. Results will be published in The New Paper, Bonjour’s website (www.bonjour.sg) and Bonjour Facebook Page (www.facebook.com/bonjoursg) on 10 September 2018. Winners will be notified by phone and/or post. Judges’ decisions are final and no enquiries or correspondences will be entertained. Bonjour reserves the right to substitute prizes with another of similar value without prior notice. By taking part in this draw, you understand and accept that Bonjour may choose to use your personal information contained herein for internal and/or external marketing purposes in a manner it deems reasonable. Bonjour reserves its absolute right, without prior notice to the participants, to suspend, terminate, change or cancel the contest (in whole or in part) or impose additional conditions as it deems fit and shall not be liable to the participants of any losses or damages suffered or may be suffered as a consequence either directly or indirectly from the Contest being suspended or terminated.